Look at Curiosity. Now, look at Curiosity’s shadow. Notice anything? Yep, there’s a very large part of the shadow, that big zigzag shape, that doesn’t seem to be there in its actual robot counterpart. But don’t panic, nothing is stalking our favorite robot across the empty plains of Mars in its latest photographic dispatch. Instead it has to do with the problems of space photography itself. 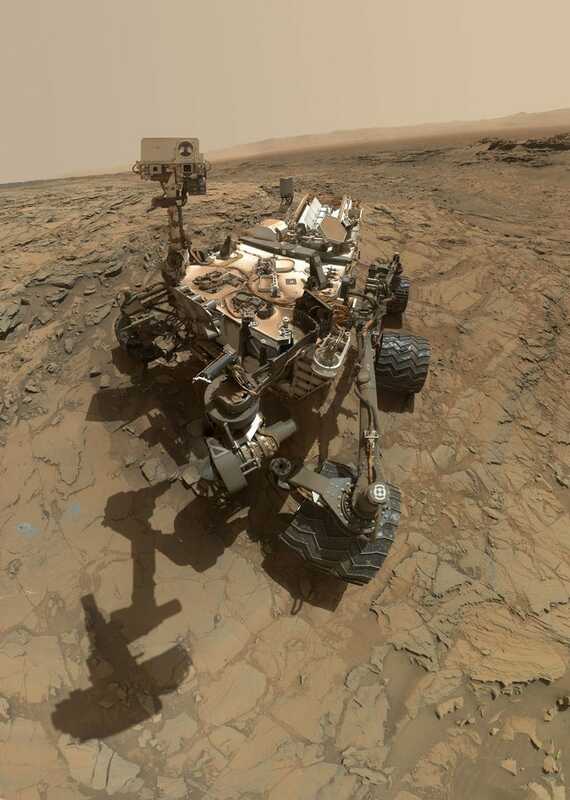 When Curiosity takes a selfie it’s not (just) for vanity or (just) for commemoration—it’s also a way for the techs here on Earth to make sure that all’s well with all the component parts of Curiosity (its wheels, its outer hardware). Because of that, having part of the rover cropped out is a big problem. So, instead of one selfie, Curiosity extends its robotic arm over itself and snaps photos from every possible angle, which are then stitched together into a single super-selfie. It doesn’t move while doing this—except for contorting its arm. This would make the final image blurred over by the movements of the arm, so NASA edits it out. The shadows, however, remain untouched, meaning that although its arm may be missing in the photos, we can still almost catch a glimpse of it.